Our DELUXE ELECTRIC FLY SWATTER, is for those who are already convinced of the effectiveness and practicality of these electronic swatter devices, and simply want a higher quality, more powerful, longer lasting version. 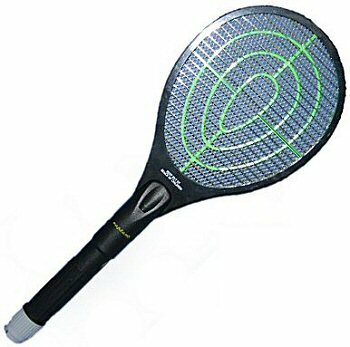 Our own review of this product has been very favourable - looking a bit like a tennis racket, this fly-killer is lightweight and certainly effective, and seems to generate a lot of curiosity. Our deluxe swatter is a cross between a traditional fly swatter and the electrostatic fly killers that often hang in butchers shops. The result is one of the most effective (and, dare we say "fun"?) solutions to the summer fly problem we have seen. What's more, our Deluxe Swatter is completely safe and the replaceable batteries last a long time. The PROBLEM: Traditional fly swatters can be useful because you can deal with annoying insects straight away, without having to wait for them to "land" on a fly-paper or UV electro-static unit. However, since you have to hit the insect against a solid surface, they often leave an unhygenic stain - not so good if you have just redecorated your kitchen, and unappetizing if you are sitting down to lunch outdoors. The problem with "stationary" electronic products, of the type that try to attract insects with an ultraviolet light, is that they are not so effective during the day, and are not very attractive to all insects, such as wasps. Chemical alternatives, such as sprays, can be noxious, and no-one really likes the idea of inhaling whatever is contained in the spray bottle. The SOLUTION: Our Deluxe Fly Swatter is a battery operated electric fly swatter, that combines the advantages of a fly swatter (ie deals immediately with the nuisance) with the effectiveness and hygiene of tradional electronic products. HOW IT WORKS: The Electric Fly Swatter requires 2 (1.5 volt) batteries to raise the voltage of the electric circuit of the fly swatter to kill insects and wasps while touching it. The output power is relatively low constituting no hazard to humans or pets. For those requiring a more technical explanation (the question is usually - how can two 1.5 volt batteries produce enough power? ), suffice to say that the batteries charge a capacitor, which then discharges instantaneously through the wire mesh when contact is made with an insect. Battery life is long - and should last for 1000's of goes. HOW TO USE IT: To kill the offending wasp or fly, simply hold the handle, push the switch and wield the Electroswat to make the insect touch the net surface. The insect will usually drop dead onto the ground - insects killed on the net surface can be brushed or shaken off (do not use water). In the office - everyone will want a go!